For professional, on-the-spot presentations, choose from our wide selection of professional easels. We sell easels that roll, easels that stand on tabletops and floors, and easels that fold up and fold out. Our easels support markerboards, flipcharts, paperpads, and just about any other display medium. In addition, you can pick up a multi-purpose, multi-functional easel you can use to write, store supplies and use as a divider to provide some privacy in your office. 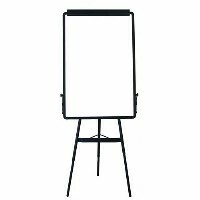 Choose a professional easel that fits your needs and turn your presentations into something truly interactive.